Readers may recall the page from Through the Looking Glass where Lewis Carroll has Humpty Dumpty saying to Alice "When I use a word,... it means just what I choose it to mean - neither more, nor less." 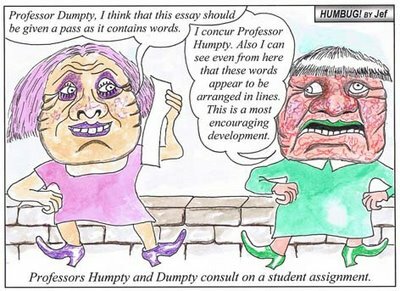 Some writers are Humpty Dumpties. They write a word (or a sentence) and choose it to mean something... even when it doesn't. Some readers are Humpty Dumpties. They read a word (or a sentence) and choose it to mean something... even when it doesn't. Alas, some wackademics are Humpty Dumpty markers. They scan-read an essay, and believe that they have seen something... some content which they are expecting... but which in fact isn't there. I have seen some remarkable results because of this practice. Some markers pass essays which have many good words - indeed, many entirely unique words. But the good words are not arranged into sentences. Call me a fusspot, but I really think the sentences are quite important, and that the words shouldn't simply be placed at random. But then, what would I know, I'm not into multiliteracies and critical literacy. I'm just a writer.